Situated at the head of a cul de sac, it is just a stone’s throw from a beautiful stretch of beach in the village of Whitburn, Sunderland. The property was fully renovated by Philip, who says he was first drawn to the idyllic coastal location and stunning views afforded by the spacious accommodation. Secure, electric entrance gates with a video entry system, give way to a parking area for up to six cars at the front of the property. An entrance porch with double arched doors then leads to a large welcoming entrance hall with solid oak staircase. There is good reception space which includes a light and airy lounge with dual aspect windows including French doors, and a very large dining room with bay window and patio doors leading out to a veranda. The spacious contemporary fitted kitchen includes a central island, french doors leading out to a back garden and a stable-style door leading to an aviary which runs the depth of the house. There is an en suite front bedroom, a shower room, family bathroom and further bedroom also to the ground floor. To the first floor is a spacious games room with balcony. This is a favourite part of the house for Philip, who said it is an ideal family room and a great place to spend time with his relatives when they are visiting him. It includes a fitted bar area and also has french doors which open out onto a balcony which has an Astro turf covering and where there are panoramic beach and sea views. Two further bedrooms, including one with an en suite and sauna, are also to the first floor. Modern touches include remote controlled back lighting to the lounge, the sauna to the fourth bedroom and integrated wine chiller and American-style fridge freezer to the kitchen. The property has arched half glazed doors, laminate flooring and spotlights throughout. There is also a lawn and patio area, two garden sheds and flower beds to the back of the property. 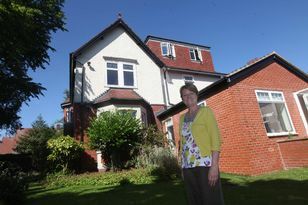 Eileen Hanson, of Andrew Craig, said: “The property has had a complete renovation since been purchased in 2007. The family moved here for the amazing views and location. “They have remodelled the internal layout and added an aviary to the side of the property. Philip added: “I originally bought this house with my late wife who sadly passed away in 2012. 8 Markham Avenue, in Whitburn, Sunderland. is for sale at £825,000, through Andrew Craig, tel: 0191 516 0239.